September 8th, 2018 for our 8th Annual Wheels on Wyandotte Car & Motorcyle Show. Free Admission for the public and the show starts at 11:00 a.m. to 4:00 p.m. Car Registration Fee is $10 and the first 300 cars will get a free Wheels on Wyandotte T-Shirt, the design and colour of which is different from last year. One T-shirt per car and any t-shirts left over after registration will sell for $15 each. Earlier registration time will be 9:00 a.m. to 1:00 p.m. There will be no pre-registration. We have also changed the method of voting for Best in Show this year. Cash prizes of $200 for first, $100 for second and $50 for third are still in place, plus a plaque, in the categories of car and motorcyle. Summit Floor & Wallcovering are the sponsors of the Cash prizes. The drivers will be voting only this year for best car in show (first, second and third) and best motorcyle in show (first, second and third). Ballots will be included in the registration package, and completed ballots should be returned to the Registration table by 3:15 p.m. Awards will begin at 3:45 p.m. The Silent Auction is back with the Windsor Spitfires Suite for one game, plus VIP Parking valued at $1,000; 48″ RCA LED HDTV valued at $600; Colman BBQ valued at $600, plus more items. Other activities for the day to include Safety Village Little Jeeps course, Games on the Move and mini-golf and putting green (safely tucked away in the west parking lot of 5745 Wyandotte). We are considerate of our great cars and motorcycles that make up Wheels on Wyandotte and that is why the mini-golf is off the street and away from the cars. There will be balloons for the kids, Kettle Korn, Mascots and BBQs. Please take the time to visit our businesses who are the sponsors of Wheels on Wyandotte. Take in the specials and delicious food served in our many restaurants. There will be the opportunity to enter your name into a draw to win Olde Riverside Dollars – first place $200, second place $100 and third place $50 (Sponsored by Olde Riverside Town Centre Business Association). Ballots will be in the stores prior to the car show and the winners will be drawn at 3:45 p.m. on September 8th. The 2017 Wheels on Wyandotte had a record number of registrations, and we are happy to say that motorcycles were in greater numbers at the show. This year an area in front of “The Beer Store”, 5455 Wyandotte (south side) will be set aside for motorcycles. However, if you wish to park elsewhere, feel free to do so. The 2017 silent auction was astoundingly successful. It, coupled with car registrations, allowed us to donate $5,000 to Windsor Police Service’s Camp Brombal for Kids. This was our fifth year working with Windsor Police. In total, we have raised $25,000 for the camp. We have added a small second hand book sale to raise more money for the camp. This will be located at the Silent Auction area at 5745 Wyandotte. Thank you to our sponsors Summit Floor & Wall covering, TD Bank, Riverside Sports and Olde Riverside Town Centre Business Association, without whom this Car Show would not be possible. 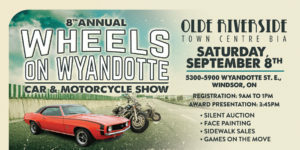 We look forward to seeing everyone on September 8th, 2018 for our 8th annual Wheels on Wyandotte. Please continue to visit our website for more information. 5 Corvettes visiting from Valley Vettes Petawawa.